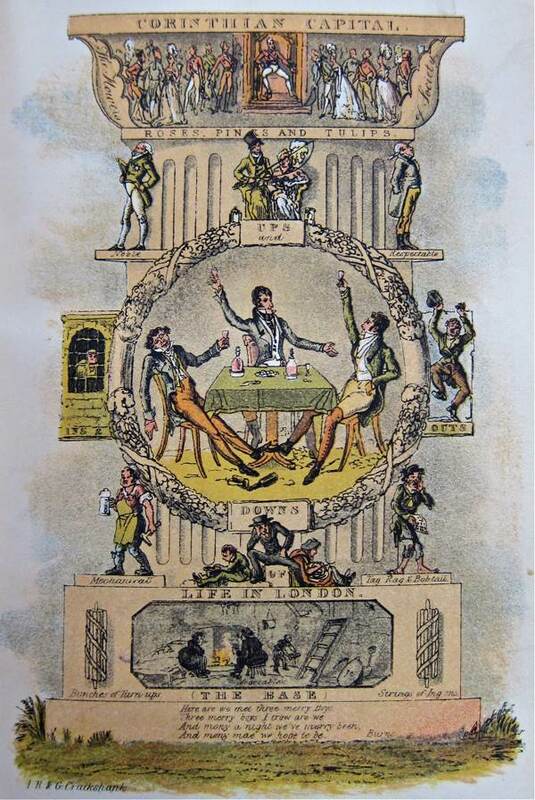 This frontispiece was intended to illustrate the varieties of “Life in London,” from the king on his throne at the top of the column to the lowest members of society at the base. At the centre are the protagonists of the tale, Tom, Jerry & Logic, three men about town. 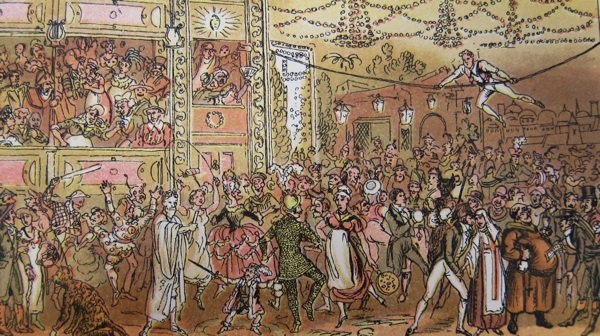 Authored by Pierce Egan, their adventures proved best sellers in serial form and were collected into a book in 1820, remaining in print for the rest of the century, spawning no less than five stage versions, and delineating a social landscape that was to prove the territory for both the fictions of Charles Dickens and the commentaries of Henry Mayhew. 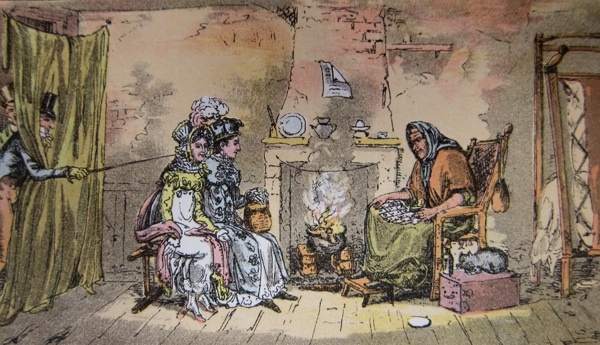 Accounts of the urban poor and of life in the East of London are scarce before the nineteenth century, and what makes “Life in London” unique is that it portrays and contrasts the society of the rich and the poor in the metropolis at this time. And, although fictional in form, there is enough detail throughout to encourage the belief that this is an authentic social picture. 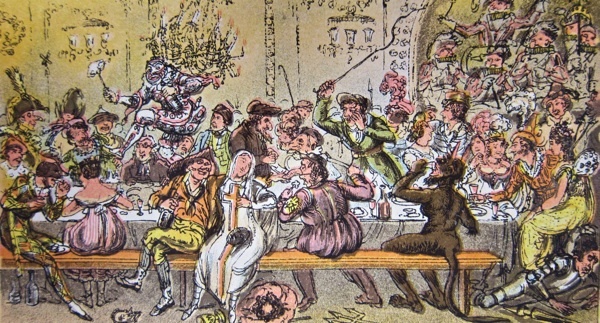 The characters of Tom, Jerry & Logic were loosely based upon the brothers who collaborated upon the illustrations, Isaac Richard & George Cruickshank, and the writer Pierce Egan, all relishing this opportunity to dramatise their own escapades for popular effect. 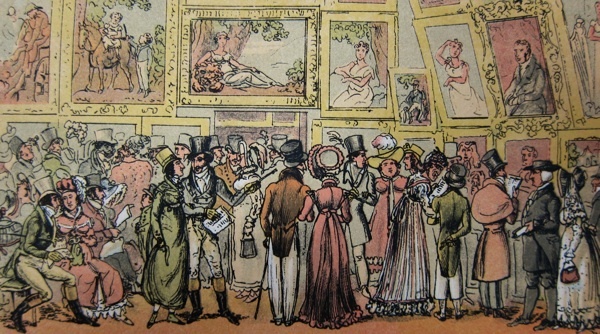 Isaac Richard & George’s father had enjoyed a successful career as a political cartoonist in the seventeen-nineties and it was his sons’ work upon “Life in London” that brought the family name back into prominence in the nineteenth century, leading to George Cruikshank’s long term collaboration with Charles Dickens. 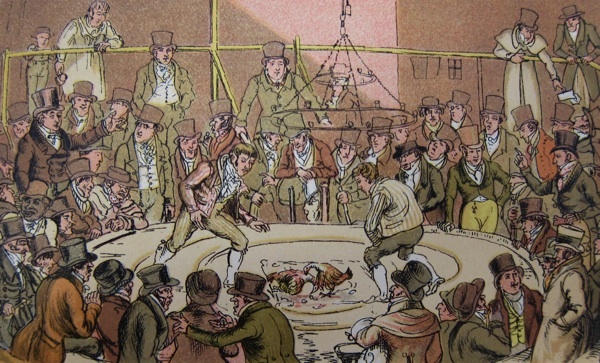 Jerry Hawthorn comes up from the country to enjoy a career of pleasure and fashion with Corinthian Tom, yet as well as savouring the conventional masquerades, exhibitions and society events, they visit boxing matches, cockpits, prisons and bars where the poor entertain themselves, with the intention to “see a ‘bit of life.” It is when they grow weary of fashionable society, that the idea arises to see a “bit of Life” at the East End of the Town.” And at “All Max,” an East End boozer, they discover a diverse crowd, or as Egan describes it, “every cove that put in an appearance was quite welcome, colour or country considered no obstacle… The group was motley indeed – Lascars, blacks, jack-tars, coal-heavers, dustmen, women of colour, old and young, and a sprinkling of the remnants of once fine girls, and all jigging together.” In the Cruikshanks’ picture, Logic has Black Sall on one knee and Flashy Nance upon the other while Jerry pours gin into the fiddler and Tom carouses with Mrs Mace, the hostess, all revealing an unexpectedly casual multiracial society in which those of different social classes can apparently mix with ease. Lowest life in London – Tom, Jerry & Logic amongst the unsophisticated sons & daughters of nature in the East. The Royal Exchange – Tom pointing out to Jerry a few of the primest features of life in London. Tom, Jerry & Logic “tasting” wine in the wood at the London Dock. Jerry “beat to a standstill” Dr Please’ems’ prescription. Tom & Jerry “masquerading it” among the cadgers in the back slums. 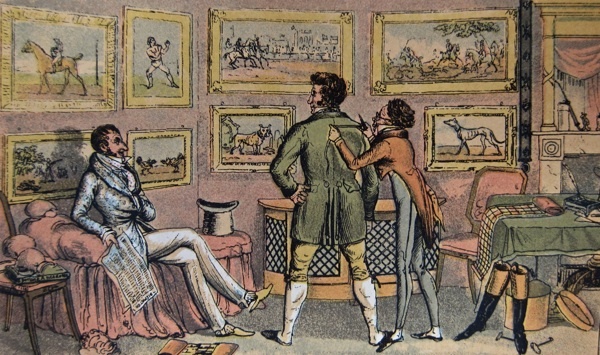 “A shilling well laid out” – Tom & Jerry at the exhibition of pictures at the Royal Academy. Tom, Jerry & Logic backing Tommy, the ‘sweep at the Royal Cockpit. Tom, Jerry & Logic in characters at the Grand Carnival. Symptoms of the finish of “some sorts of life” – Tom, Jerry & Logic in the Press Yard at Newgate. 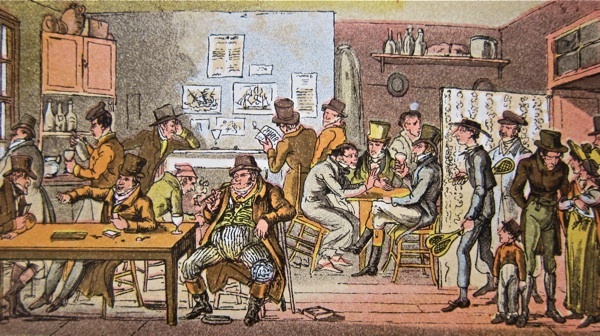 Life in London – Peep ‘o day boys, a street row. the author losing his “reader.” Tom & Jerry showing fight and Logic floored. 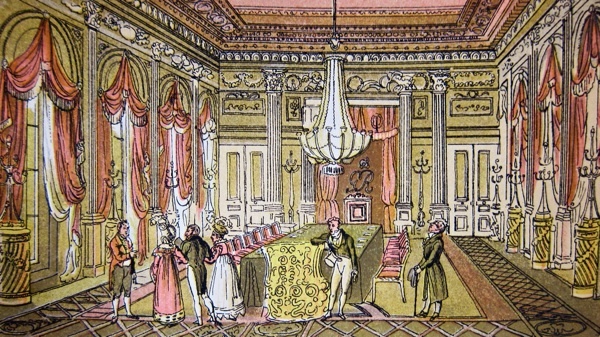 The “ne plus ultra” of Life in London – Kate, Sue, Tom, Jerry & Logic viewing the throne room at Carlton Palace. Tom & Jerry catching Kate & Sue on the sly, having their fortunes told. 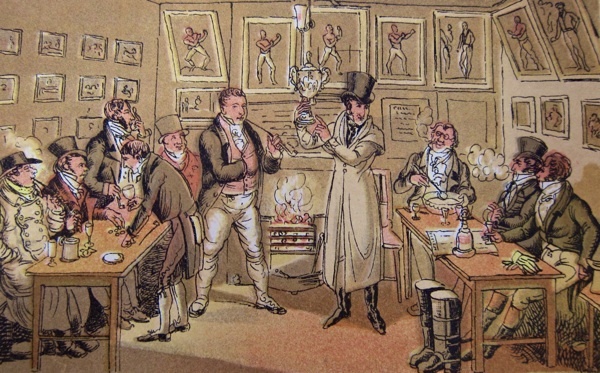 Jerry’s admiration of Tom in an “assault” with Mr O’Shannessy at the rooms in St James’ St.
Tom introducing Jerry & Logic to the champion of England. 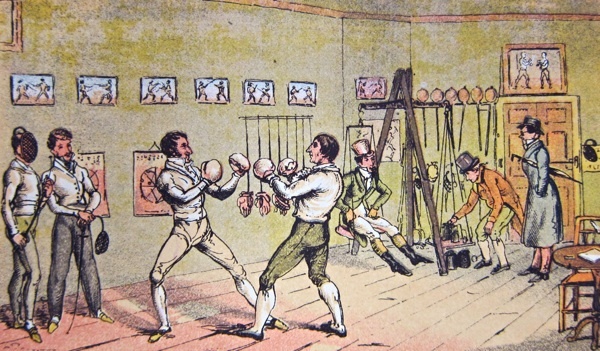 The art of self-defence – Tom & Jerry receiving instruction from Mr Jackson. Tom & Jerry larking at a masquerade supper at the Opera House. Tom & Jerry in trouble after a spree. Great post, as always. Just thought I’d point out that today is the 150th anniversary of the creation of the Peabody Housing Trust. 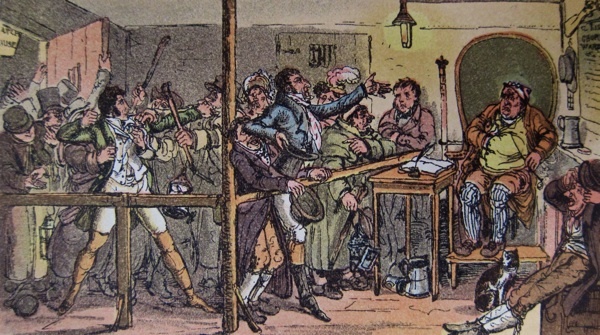 The first estate was built in Spitalfields soon after. Don’t forget the tiny drawings down the right hand side – I love them! Who did those? Do you know ‘The London Spy’, by Ned Ward, published in 1703? 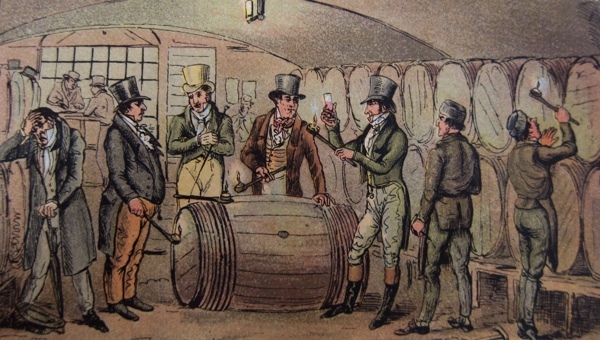 Ned Ward was the landlord of the Kings Head Tavern next to Gray’s Inn. 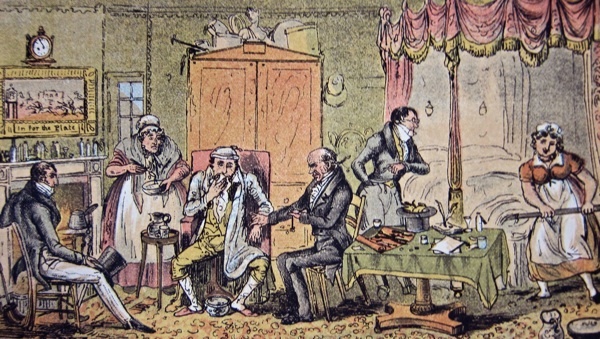 It is in a similar vein to Tom and Jerry’s adventures, purporting to be the journal of a naive countryman visiting various sights of London such as Billingsgate, coffee houses, and Bartholomew Fair. 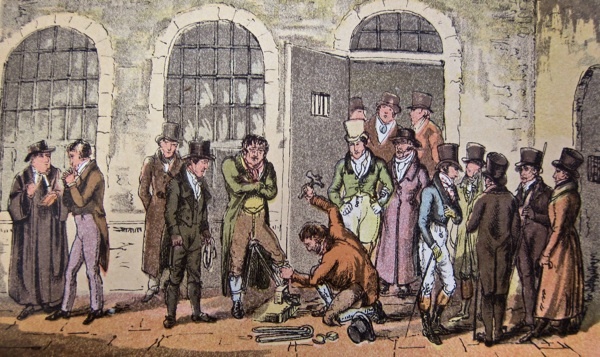 The journal ostensibly points out and condemns the vice and impiety it finds in London in the late C17th, but it does so, according to the introduction to the Folio Society edition of 1955, ‘with such gusto that one may be pardoned for sometimes doubting the sincerity of his strictures upon those whom he scourges’. 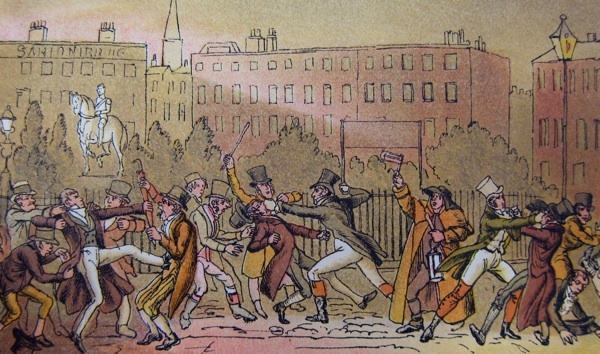 It’s a very jolly read, about a period during which London was changing dramatically, at the birth of the modern age. 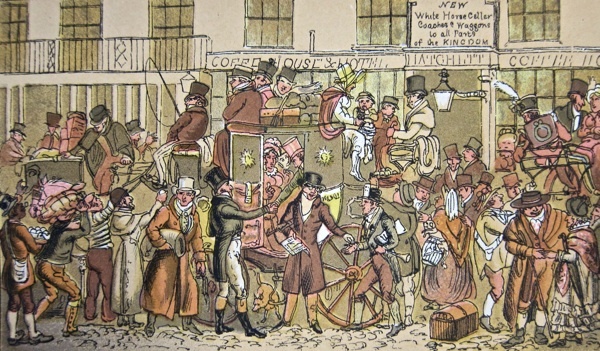 I’d also value your thoughts on The Tatler and the Spectator, both of which provide fascinating insights into life in and around the city of London in the first and second decades of the C18th. 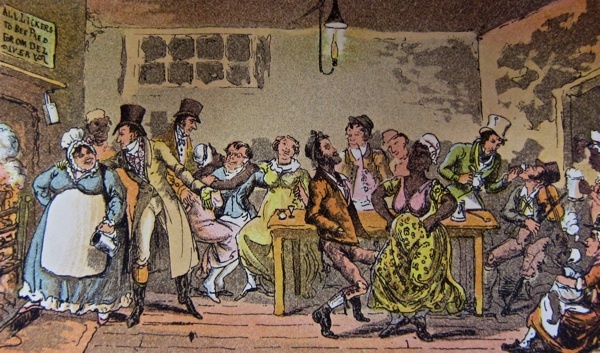 Like Tom Moore’s satire, Boxiana was a showcase of ‘Fancy slang’. As the writer Don Atyeo has explained, ‘“Ogles” were blackened, “peepers” plunged into darkness, “tripe-shops” received “staggerers”, “ivories” were cracked, “domino boxes” shattered, and “claret” flowed in a steady stream’. Egan’s synonymy made him the father of every sportswriter who has followed. ‘We’ had also come to epitomise a whole world. The adjectival use of tom and jerry lasted into the mid-century. 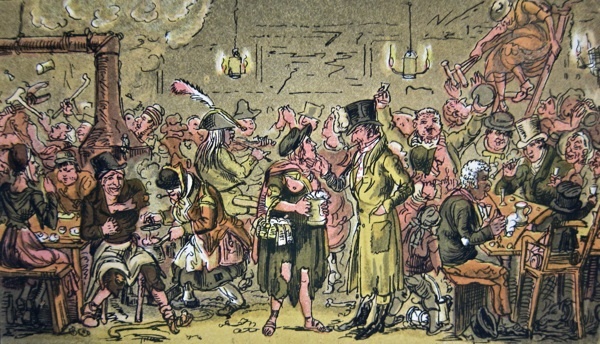 Young men went on ‘Tom-and-Jerry frolics’, which usually featured the picking of drunken fights and the destruction of property, and in 1853, in Surtees’ Mr Sponge’s Sporting Tour, the ageing rake Mr Puffington, ever-assuring his friends that, like Corinthian Tom, he could show them ‘Life’, can be found reminiscing and ‘[t]elling how Deuceace and he floored a Charley, or Blueun and he pitched a snob out of the boxes into the pit. 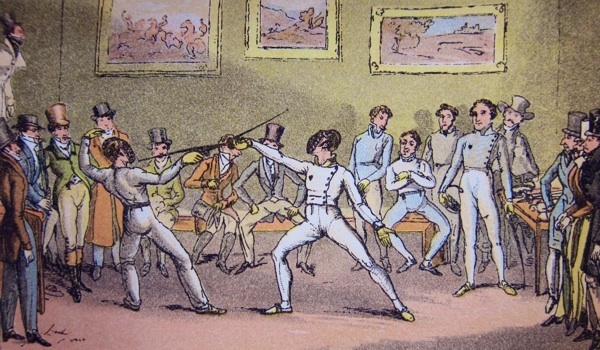 This was in the old Tom-and-Jerry days, when fisticuffs were the fashion.’ There were tom-and-jerry shops, which were cheap, rough taverns, tom-and-jerry gangs of rowdy, hedonistic young men, and a verb use which mean to go out on a spree. 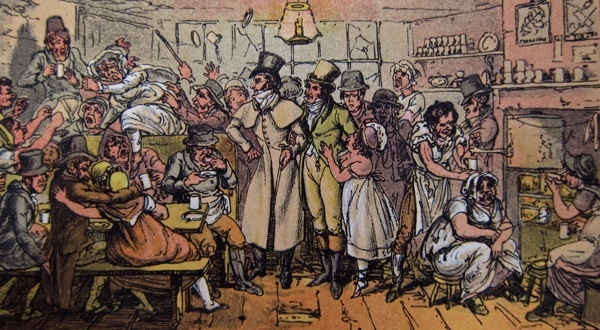 By 1840 the names had come to christen a highly spiced punch, still being served up by Damon Runyon in ‘Dancing Dan’s Christmas’ a century later. At some stage it was adopted by London costermongers to mean a cherry in rhyming slang. This is an interesting article (including the various comments) about this oft-neglected writer. 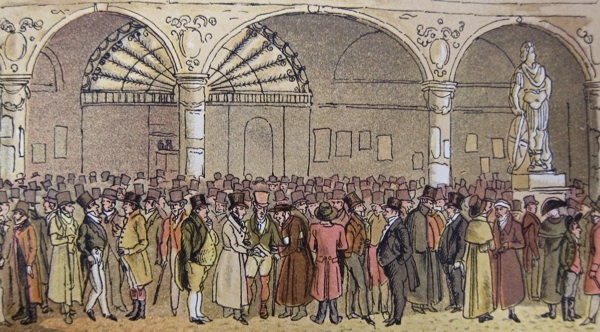 A new book devotes attention to Egan’s metropolitan writing, as well as its principal subject; his prizefight reporting. The mixture of slang and sporting jargon overlaps.